Lisa made two presentations at Lollypop Farm’s conference in Rochester, NY on October 12, 2018. Her first presentation “Animal Abuse and the Community: How Professionals Can Work Together” focused on what professionals from a range of disciplines need to know about the relationship between animal maltreatment and other antisocial behavior. 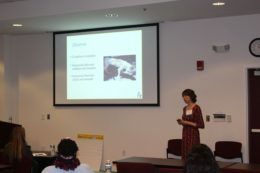 In her second presentation “Intervention Programs for Animal Crimes Offenders” she discussed the BARK program that she developed at the Animals and Society Institute. The 16-week program for misdemeanor animal maltreatment offenders is currently being piloted in Syracuse, NY and will launch in Rochester, NY in 2019. Lisa was a guest on DOG TALK® and discussed senior dogs and The Grey Muzzle Organization’s grant program designed specifically to help them. This Gracie® Award winning show, produced and hosted by pet wellness advocate Tracie Hotchner, has been broadcasting for over 9 years with 500+ shows from the NPR station Peconic Public Broadcasting in the Hamptons, where it is heard from the East End across all of Long Island, into Southern Connecticut and Westchester, as well as on the local NPR station Robinhood Radio in the Berkshires. DOG TALK® features global authors and experts discussing far-ranging topics involving dogs and cats. 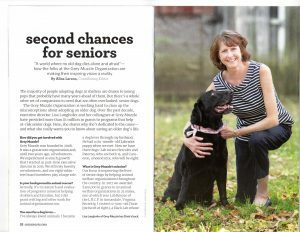 The Grey Muzzle Organization and Lisa’s work on behalf of senior dogs was featured in the winter edition of All Creatures magazine. Lisa presented two workshops at the 36th Annual Michigan Statewide Conference on Child Abuse and Neglect: Prevention, Assessment & Treatment held at the Inn at St. John’s in Plymouth, Michigan. On October 23, she presented “Animal Abuse and Children: What All Professionals Need to Know.” This session explored the dynamics of animal abuse and its relevance to the work of professionals in a range of disciplines, including child welfare, mental health, education, social work, law enforcement, and juvenile justice. She discussed the growing body of research on the relationship between animal abuse and other types of antisocial behavior, focusing on animal abuse as an important risk factor in children. State legislation in response to the growing recognition of the link between animal abuse and interpersonal violence was presented. What to do if concerns about animal abuse are identified and ways in which human services and animal welfare professionals can better work together to address childhood animal abuse were discussed. In a second workshop, Lisa presented, “Animal Abuse and Children: Tools You Can Use.” This session explored why it is important to take childhood animal abuse seriously and its relationship to other risk factors, including maltreatment. Participants learned about animal abuse as an early marker for conduct disorder and research that suggests animal abuse may be related to other adverse childhood experiences. Using case studies and video vignettes, we discussed what professionals should look for and the types of questions that might be asked about animal-related experiences. The session concluded with a discussion of trauma-focused strategies for intervening with children who have engaged in or witnessed animal abuse. Lisa was a featured speaker at the SAWA Management Conference in Long Beach, CA, where she presented “Planning for Success: Using Logic Models as a Road Map.” The session helped animal welfare professionals to work smarter and use evaluation as a tool for continuous improvement. She explained the importance of logic models and how they increase a program’s likelihood of success; discussed the ways in which logic models can support program planning, implementation and evaluation; and helped attendees to develop their own logic models for planned or current programs. Lisa presented “Children & Animal Abuse: What You Need to Know to Effectively Advocate” at the annual Maryland CASA conference in Annapolis, MD. The session focused on children’s relationships with animals as both risk and protective factors. We discussed why it’s important to take childhood animal abuse seriously and its relationship to other risk factors, including abuse and neglect. Key factors to consider when assessing animal abuse and approaches to exploring a child’s relationship with animals were presented. The session concluded with a discussion of trauma-focused strategies for intervening with children who have engaged in or witnessed animal abuse. Case examples were used throughout to illustrate key points. Participants were encouraged to share their experiences and ask questions. Listen to Lisa’s interview on The Pet Buzz, an animal-related lifestyle radio program airing in NY, FL and a number of other states. 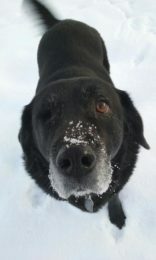 She talks about senior dogs and the ways in which The Grey Muzzle Organization is helping to give them second chances on a nationwide scale. Lisa is thrilled that her work with The Grey Muzzle Organization on behalf of senior dogs was featured in a story in the Washington Post: “More people are adopting old dogs — really old dogs.” The story was picked up by msn.com and syndicated in newspapers and other media outlets nationwide and in Canada, including Tampa Bay Times, Denver Post, News & Observer in Raleigh, NC, Ft. Worth Star Telegram, Minneapolis Star Tribune, Miami Herald, Wichita Eagle, Sarasota Herald-Tribune, NewsOK.com (The Oklahoman), Bradenton Herald, Independent Tribune, the Huffington Post, Dogster, the Dodo, and SFGate. Lisa was invited to participate in the National Council on Pet Population (Council) and the Society of Animal Welfare Administrators (SAWA) Research Symposium entitled “Solid, Stretched or Broken? : the Human-Animal Bond” where she presented “Shelter dogs and veterans: A comparison of two different program models.” The number of animal-assisted programs that pair veterans with shelter dogs is growing. Yet there is great variability in program models and little information on effectiveness. Program goals vary and may include helping veterans to re-enter civilian life, develop job skills, reduce PTSD symptoms, and gain social support. The presentation outlined the findings from evaluations of two different types of programs that pair veterans and shelter dogs: Soldier’s Best Friend (SBF) and VALOR. Differences and similarities in the two program models were discussed, and preliminary research findings from interviews with veterans from both programs were presented. Lessons learned and considerations for implementing similar programs were discussed. On June 22, 2016, Lisa presented her third webinar in the Animal Abuse and Children Series. During “Intervening with Children who Witnessed or Engaged in Animal Abuse” she described and discussed the range of intervention resources available for children who have witnessed, engaged in, or are at risk of engaging in animal abuse. These include psychological intervention using the AniCare Child approach and psycho-education programs such as the Children and Animals Together (CAT) Assessment and Treatment Program. She also discussed prevention programs for children who are at risk of engaging in animal abuse. This webinar series is sponsored by the InMaat Foundation and has been approved for 1 CE point of continuing education credit toward the Certified Animal Welfare Administrator credential. “Intervening with Children who Witnessed or Engaged in Animal Abuse” was recorded and can accessed free of charge. On May 25, 2016, Lisa presented the second webinar in a three-part series on Children and Animal Abuse. During “Assessing Children’s Relationships with Animals” Lisa focused on assessing children’s relationships (both positive and negative) with animals. She discussed what professionals should look for and the types of questions that might be asked about animal-related experiences. Using case examples, she discussed the importance of individualized assessment and reviewed factors to consider in assessment. This webinar series was sponsored by the InMaat Foundation and approved for 1 CE point of continuing education credit toward the Certified Animal Welfare Administrator credential. “Assessing Children’s Relationships with Animals” was recorded and can be accessed free of charge. On May 15, 2016, Lisa was in Prague, Czech Republic, conducting two workshops at the Animal Assisted Intervention International Conference. During “Pairing veterans and shelter dogs: A comparison of two different program models” Lisa discussed the fact that the number of animal-assisted programs that pair veterans with shelter dogs is growing. Yet there is great variability in program models and little information on effectiveness. Program goals vary and may include helping veterans to re-enter civilian life, develop job skills, reduce PTSD symptoms, and gain social support. Lisa’s presentation outlined the findings from evaluations of two different types of programs that pair veterans and shelter dogs: Soldier’s Best Friend (SBF) and VALOR. Differences and similarities in the two program models were discussed, and preliminary research findings from interviews with veterans from both programs were presented. Lessons learned and considerations for implementing similar programs were discussed. During “Got Outcomes?” Lisa emphasized that the success of animal-assisted programs depends on providers’ ability to clearly articulate program elements, implement programs as designed, and track outcomes to ensure the program delivers intended results. Participants learned how to use a variety of tools (logic models, fidelity assessments, performance indicators) to develop, implement, and assess programs. Lisa used program scenarios to help participants practice building logic models and selecting performance indicators to evaluate the effectiveness of their programs. She also discussed the importance of measuring program fidelity and provided real-world examples of ways to assess whether programs are being delivered as intended. On April 20, 2016, Lisa presented the first of three webinars on animal abuse and children in collaboration with the Humane Society Academy. During “Animal Abuse and Children: An Important Risk Factor” Lisa discussed the role companion animals play in children’s lives and the growing body of research on the relationship between animal abuse and other types of antisocial behavior. Using case studies, she explained why all professionals dealing with children should be aware of animal abuse as a risk factor for children. The webinar was sponsored by the InMaat Foundation and pre-approved for 1 CE point of continuing education credit toward the Certified Animal Welfare Administrator credential. “Animal Abuse and Children: An Important Risk Factor” was recorded and can be accessed free of charge. Tune in at 1 p.m. on October 24, 2015 to WXPI 88.5 in the Williamsport, PA area. Lisa will be a guest on Tail Tales and will discuss her work with Grey Muzzle on behalf of homeless senior dogs. 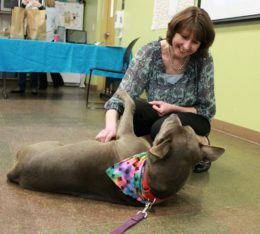 Lisa presented a day-long workshop at Animal Friends in Pittsburgh, PA, for professionals from a range of disciplines who work with youth, including social workers, attorneys, probation officers, judges, school counselors, teachers, child care providers, mental health professionals, and community members. The session began with a discussion of the role companion animals play in children’s lives. We discussed the growing body of research on the relationship between animal abuse and other types of antisocial behavior, focusing on animal abuse as an important risk factor in children. Participants learned about animal abuse as an early marker for conduct disorder and research that suggests animal abuse may be related to other adverse childhood experiences, including maltreatment. Using case studies and video vignettes, we explained why all professionals dealing with children should be aware of animal abuse as a risk factor, and discussed what professionals should look for and the types of questions that might be asked about animal-related experiences. On August 9, 2015 Lisa and colleagues presented a symposium on Human-Animal Interactions in Treating Veterans with PTSD at the 2015 American Psychological Association (APA) Annual Convention held in Toronto, Ontario, Canada. Lisa’s presentation outlined the findings from evaluations of two different types of programs that pair veterans and shelter dogs: Soldier’s Best Friend (SBF) and VALOR. SBF is a year-long program in which veterans are matched with a shelter dog. Veterans live with their dogs and train them to perform various types of services designed to help ameliorate PTSD symptoms. In addition, SBF program graduates are asked to mentor new veterans entering the program. VALOR is an eight-week program in which groups of five veterans socialize and train shelter dogs that have been subjects in abuse and/or neglect court cases. Through their work with these dogs, the VALOR program is designed to help veterans gain a sense of self-efficacy, improve self-esteem, learn dog training skills that could be used to gain employment, and receive social support from other veterans. The presentation concluded with a discussion of the differences and similarities in the two program models and preliminary research findings from interviews with veterans from both programs. On June 22, 2015 Lisa was in Sylvania, Ohio providing a training at the School Therapy Dog Workshop being sponsored by Assistance Dogs for Achieving Independence. As part of her work through the Animals and Society Institute, she discussed the importance of identifying and assessing children who have abused animals and may also be experiencing other types of trauma.